Have You Ever Heard Of Paramagnetic Rock? How About Andesite? Before I go on any further with this topic, I’d like to clarify what Paramagnetism is. It is a simply a form of magnetism that is influenced by internal and external magnetic fields. Paramagnetism was first named by the famous physicist and chemist Michael Faraday way back in 1845. Since that time, it has been thoroughly and exhaustively studied by scientists and is accepted as a scientific fact. Paramagnetic rocks are natural rocks that contain paramagnetic qualities. Many types of rocks can have these attributes, but for the purposes of this blog, I’ll focus on Andesite. This rock comes from ancient lava beds and it sources its power from the electrical charges in those long-ago eruptions. Paramagnetic levels can be tested using a Phil Callahan Soil Meter (pricey but effective). These levels are measured in CGS (centimeter/grams/seconds), with 9,000 being at the top of the spectrum. (the Andesite Mineral Complex we carry has 8,000+cgs). Soil levels can be as low as 25 – a seriously ill soil. 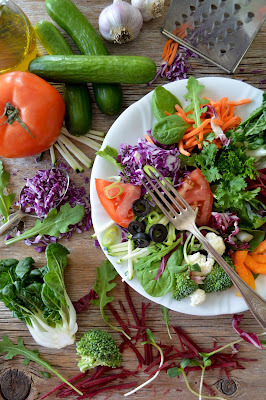 We know that soil can be depleted over time, either by overuse, misuse or general human use. 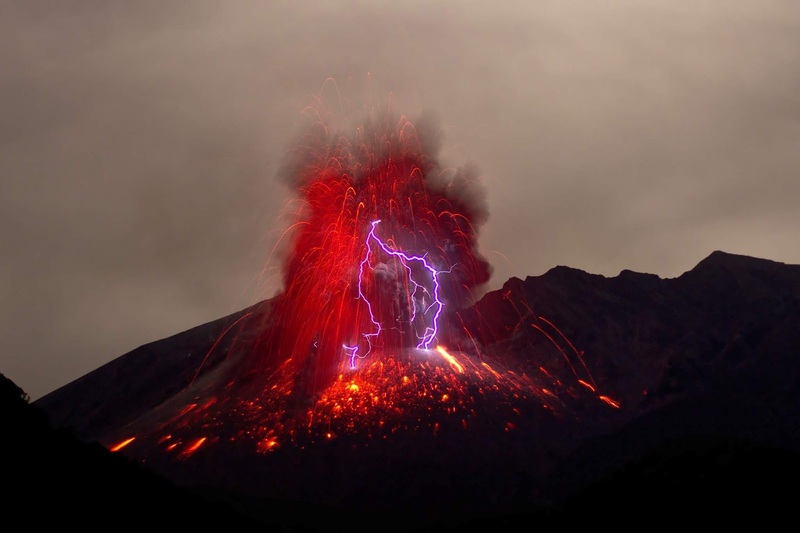 In the distant past, volcanoes were the agent for re-mineralization. 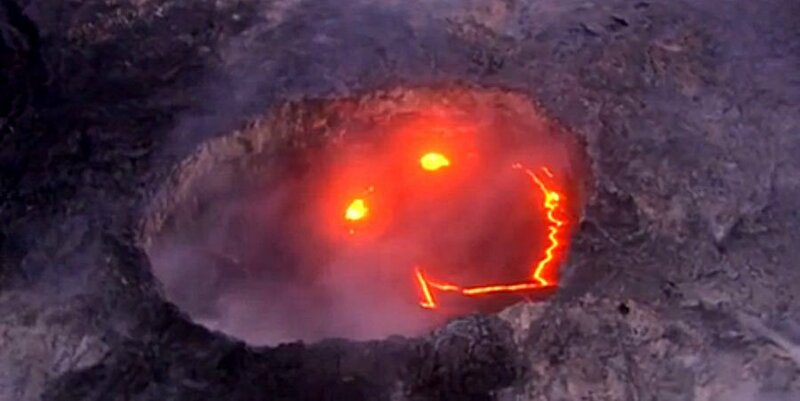 Many of those minerals are still locked in that ancient lava. We go straight to that source for our Andesite Mineral Complex. 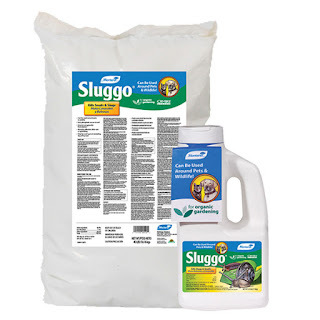 The result is a soil amendment swimming in essential minerals and trace elements. The use of paramagnetic rock as a soil amendment is where the “controversy” begins. There is little doubt that adding Andesite (or another paramagnetic rock dust) is beneficial to the soil and, thus, the plants that grow in it. However, how it achieves this is questioned by many. Some people are adamant that the main benefit is derived from the minerals inherent in the rock, while others credit the electrical charge with stimulating microbial life in the soil (which translates into healthier soil and bigger, better plants). Dr. Thomas M. Dykstra of Dykstra Laboratories was motivated enough by this question to study it in detail. His results indicate that the paramagnetic energy stimulates the plant roots, leading to more robust growth. If you are interested in further information on paramagnetism, I suggest you begin with the work of Dr. Phil Callahan. He developed the aforementioned soil meter and is considered by some to be the Godfather of paramagnetism. All things on Earth have an electrical charge. 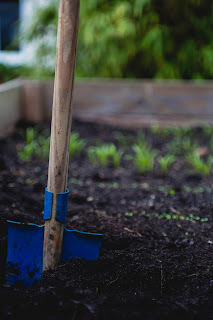 By adding a little paramagnetism to your garden, you can plug into this cosmic hum and provide your plants with the deeply natural minerals and elements they crave. The Universe will thank you. Eyes – Those giant eyes on either side of their triangular heads may seem endearing and quizzical when they slant their heads and look at you, much like when your dog looks at you and tilts his head. However, the mantis’s gesture is anything but loving or lovable. Those eyes see in 3D and each has an area in it (the fovea), that allows the insect to focus on and track an object more intently. On top of all that, they have 3 simple eyes in between the big ones. All this is designed to find prey with pinpoint precision. So, if they look at you like that, they are determining the best way to kill you; they're not trying to communicate with you. 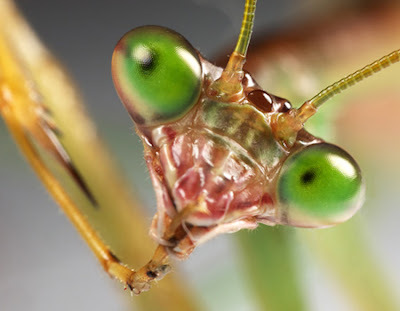 Ear – For all the eye power a praying mantis has, it only has one ear (the tympanum). Of all the insects, mantids are the only ones that have just one ear. This ear is located on the underside of the body between their legs. They may have only one ear, but like their eyes, it is extra-sensitive. This allows them to clearly hear their quarry before they can see it. Food – Mantids will attempt to devour nearly anything that they clap eyes on, with one caveat: they only eat live and moving prey. 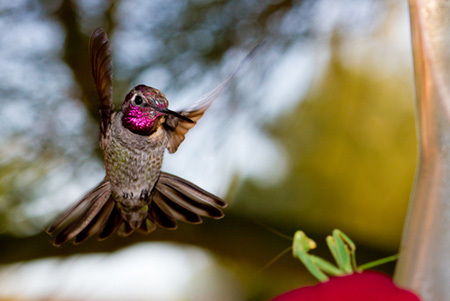 They will eat each other as soon as they hatch and everything from small skittering insects like spiders, to moths, butterflies on up to small lizards and mice (here is a mouse vs. mantis video) and birds. 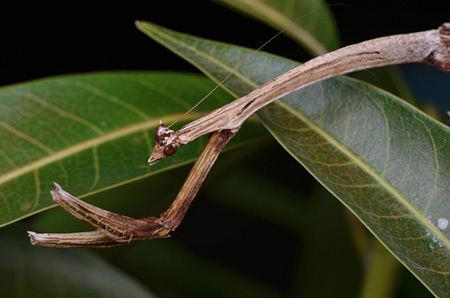 Mantids that hunt birds seem to be exclusively female and seem to have an affinity for the bird brains Scientists have found bird skulls with holes in them after mantis attacks. 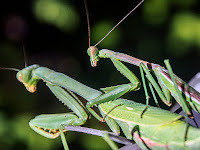 This is unusual in that usually a mantis will bite the head off a victim right away (to quickly stop the struggling) and then proceed to consume the whole body. Bird brains must be a special treat for a lady mantid. 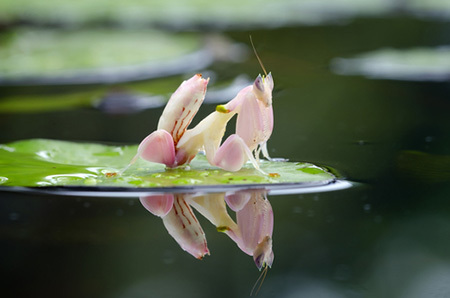 Mating - It is commonly believed that female mantids kill their partners during or after mating. This is only partially true. It appears that only about 15% of females do this. While some speculate that the killing is done for the added protein to develop eggs, there also doesn’t seem to be an inherent need to do so (or they would all kill their lovers). It could be another example of how they kill anything that moves and the male just moved too much or one too many times. Moves – Praying Mantids have long been associated with the martial arts for very good reason. They are masters of movement. They can been utterly still for hours and then leap onto prey in a strike that’s faster than the eye can follow (see how here). When they are fending off predators, they stand up, spread out and wave their spiky legs in motions intended to intimidate (which look like martial arts movements). If they have to resort to retreat, they are masterful in the way they leap and twist in the air. Watch a Kung Fu praying mantis take on a jumping spider here. 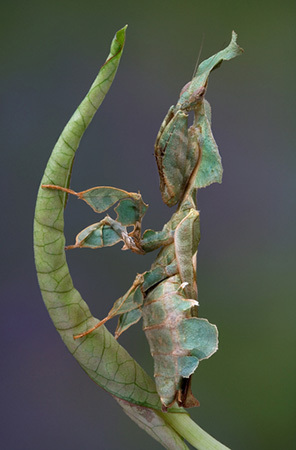 Camouflage – A huge part of being an ambush predator is being able to hide well and the mantid world is full of experts in the art of concealment. Of the more than 2,000 named species, most of them are found in the tropics. This explains why there are so many mantid varieties that look like beautiful flowers. 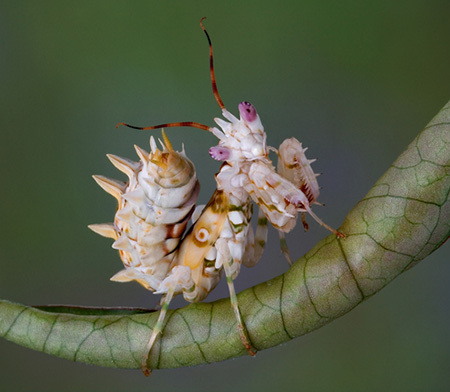 Relatives – If you aren’t freaked out by mantids by now, this may due to trick: they are close relatives of the cockroach. And termites. As John Abbott, chief curator and director of Museum Research and Collections at the University of Alabama, “So, basically you can think of termites as social roaches and praying mantises as predatory roaches”. 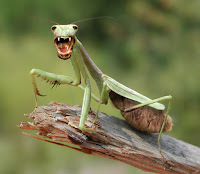 And now for some comic relief: Praying Mantids aren't quite as ferocious as this picture on the left or as shown in this silly video (at least not to us humans), but they are decidedly terrifying in the insect world. Having said all this, I encourage to explore the intriguing world of the Praying Mantis. 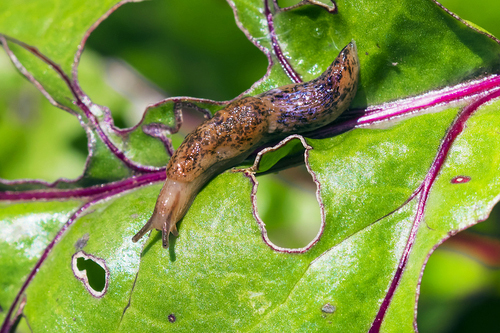 Put some in your garden (though not immediately after introducing beneficial insects) or bring an egg case (ootheca) home or to your classroom and wait for them to hatch. The babies are pretty cute. Information on hatching and how to buy can be found here.